Tenkar's Tavern: I've Got Something to Read During the Downtime Tonight at Work - And I'm NOT Batman! I remember when the Waldenbooks at the mall had a STACK of these books. That's probably the best version of the DC Heroes "MEGS" rules on the planet. Other versions succumbed to bad organization or to overgrowth. But constrained to the world of the Dark Knight, and not required to include extraterrestrial boy scouts or Amazon princesses, the game felt nicely tight and integrated. Even for the full game the MEGS system balanced Batman against Superman level play shockingly well. I picked up an old beat up copy not too long ago, as well, and may also never get a chance to play it. Of course, that might not be what you're fully implying; I look forward to seeing what you have in store! Yes, I know, an active Yahoo group. My favorite supers system of all time. 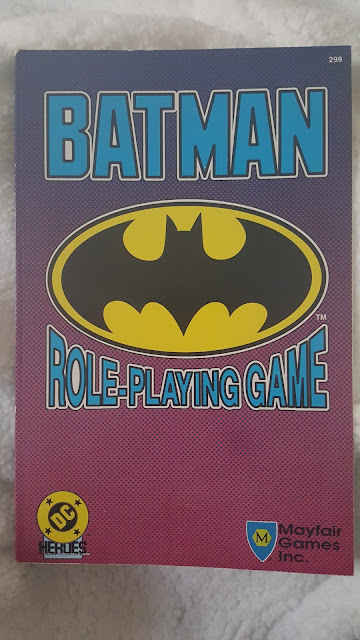 I remember grabbing Batman RPG at a con on the west coast when it came out....probably Westercon or something. I played the hell out of all editions of DC Heroes until the mid nineties. I remember this one...played it in the Army after the first Keaton movie came out. That was smart marketing and timing on Mayfair's part because I had looked at DC Heroes, but had only played Champions and Marvel to that point. It uses the same system as Mayfair's Underground RPG. I used to play DC Heroes many moons ago. My friends Adam and Eric would play Batman and the Flash and go on the fevered adventures of my 19 year old mind. I later played Underground and then swore off the system for better pastures. Good times though, the game brings back fond memories.